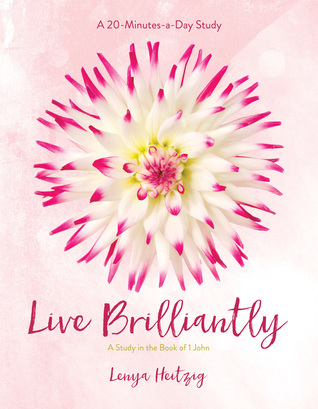 This all-new Fresh Life Bible study takes readers through the book of 1 John, inspiring them to respond to God’s call to be light bearers in a dark world. Each 20-minute study of 1 John in Live Brilliantly reminds readers that when their lives reflect God’s light, no darkness can overtake them. When a Christian follows God’s Word, light shines on their decisions, relationships, and actions. Their words as they live out the gospel bring light to even the darkest places. This rich yet accessible Bible study ignites readers with a new passion for God, shutting out the darkness that threatens their spirits and the world—because God’s Word is light everlasting. "Love Brilliantly" by Lenya Heitzig is an awesome Bible Study! I love that I can grab this Bible study in the morning and study the book of 1st John for twenty minutes and head out the door. It is a great study tool to be in God's word and to fellowship with him daily, but it also works with my schedule in a way where I am able to be in the presence of God in the morning. I used to only spend time in God's words in the evening because my mornings were so crazy, but I found a way to start doing this studying so I could spend time in God's work for twenty minutes every morning. This study has twelve chapters and breaks down into 5 days a week. Each section has spots for you to lift up, live out and look out, which I love. This Bible study makes application of the Bible easy. Also, I love the feel of this Bible study in my hands too. It feel very sturdy. If you are looking to start a small group up with women, I highly recommend checking out this Bible study. It is very impactful and will change your relationship with the Lord. I give this 5/5 stars. Thank you to to Wynn Wynn Media for providing this amazing Bible Study. A favorable review was not required.